Over time your knife’s edge will begin dull and the blade’s finish will need to be polished. One of the most dangerous things in the kitchen is a dull knife. If the blade is not sharp enough to cut through, then you are more likely to be prone to accidents. There are several different tools to sharpen and polish your knives, but using the best sharpening stone will work in your favor. A sharpening stone will also sharpen any other straight edge tool such as scissors or shears, swords, axes, machetes and razor blades. A sharpening stone can be made up of many different types of materials which have a coarse surface to drag and pull the knife’s edge against. Sometimes the stone will also include a base to keep the stone in one place while sharpening a knife. If there is no base to the stone, then you can always place a damp towel under the stone while you are sharpening your knife. There is also a specific technique for using a knife sharpener. Some stones may require you to lubricate them with water or oil. Others may have a finer grit to keep the sharpening accurate. The grit of the stone is determined by how coarse the surface is. Grit can range anywhere from 200 all the way up past 8000. The higher the number of grits, the finer the surface will be. Finer surfaces are used to get as close as possible while the coarse surfaces are used to begin the sharpening process. Using a sharpening stone can be difficult for a beginner. In case you may need a reference or crash course, use these instructions. In this article, we will cover the different types of sharpening stones and what makes each type unique. We will also cover some of the best sharpening stones on the market today. Water sharpening stones are usually made up of synthetic materials. These types of knife sharpening stones are the most widely used among professionals. They are very easy to use and need little to no extra care. Before using a water stone, you will need to soak it in water for about 10 minutes. Once they are soaked, you are able to polish and sharpen your tools. Some stones only need to be rubbed with a little water before sharpening as well. Just like the water stone, the oil stone is also widely used. However, the stone needs to be rubbed with oil before sharpening, which can be quite messy. Oil stones work the best with stainless steel kitchen knives, more specifically the filet knife. A diamond sharpening stone is the king of sharpening tools. This type of stone can be used dry, with oil or water as a lubricant. Diamonds are naturally sharp and very hard meaning they will cut fast and hard. It does not take much effort to damage a knife on a diamond stone if you don’t know what you are doing. The stone can overwork the edge of the blade very quickly by grinding off too much. It is recommended to use a diamond stone on severely blunt, damaged or dulled knives. This stone would not be the best knife sharpener for fine-tuning a carving knife. Ceramic sharpening stones are usually a double-sided stone, one side is coarser than the other. These stones can be used without any lubricant like oil or water but some think soaking the stone in water for 10 minutes will help soften up the stone, making it easier to get a finer edge. These sharpening stones are some of the most popular among chefs to be used as a workhorse and sharpen all the tools. However, they need to be handled with care. If dropped, they could break very easily. This premium water stone is actually a great product at a reasonable price. The stone is a dual grit meaning there are two sides with different grades of grit that can be interchanged. The stone also comes equipped with a rubber studded, hand-crafted bamboo base to hold the whetstone in. The rubber studs help to keep the stone in place when you are sharpening a knife. This is a great stone for beginners as this stone comes with tons of information to help you out. There is a free e-book that comes with the block and also an angle guide to help determine the accuracy of the blade’s edge. This model of water stones is a step down from the previous model mentioned. However, it is also about half the price. The stone is dual sided with two different grades of grit and comes with a hard-plastic base to hold it in place. The base does not have any rubber studs or slip resistance so you may find it hard to stay in one place while sharpening your knife. This stone also needs to be soaked in water for at least 10 minutes to allow the water to seep into the pores of the stone which make it softer and easier to sharpen items. This does make the stone significantly softer which also makes it prone to chipping and damages. DMT has set the standards high with this wonderful diamond stone knife sharpener. DMT is the leading technology in diamond stone sharpeners for the industry. The stone comes with two-sided grit, one for coarse and one for fine and is able to be used with or without water. It also comes equipped with a hard-plastic base to keep the stone locked in place when sharpening or storing. This stone will take all the hard work out of sharpening your knives by doing it in a fraction of the time it would with other stone sharpeners. So be careful because a little bit can go a long way. This is actually a great deal on a water stone sharpener. The price is more than reasonable and it has some features the other costlier brands do not have. The main feature that sets this model apart from the other is the base it is equipped with for locking the stone in place and storing. The base is made of silicon making it incredibly slip-resistant which is a huge plus. The stone does need to be soaked in water to be used and may become fairly soft or brittle so handle with care. The stone is also dual sided with two strengths of grit. However, the grades of the grit are quite high which make it harder to sharpen a very dull blade. This could take some extra time and effort using this stone. This water sharpening stone hails from Japan and can be quite expensive for being how limited it is. The stone is one single grade 1000 grit on all sides of the stone and must be soaked in water for at least 5 minutes before using. This means the stone will only sharpen or grind using one coarse surface. The grit grade is for mid sharpening levels and mean you can’t get a finer grit to really get and accurately razor-sharp edge like most other stones. The stone is also equipped with a hard-plastic base to lock the stone in place when in use or for storing. This moderately priced water stone is actually a pretty good stone among the rest. This stone has all the features you will need in a water stone to successfully sharpen your knives. The stone is dual sided with very high grades of grit intensity for super accurate edges. This means it will take some time to sharpen if the blade is very dull. The stone comes equipped with a blue plastic hard case to lock the stone in place for when in use or storing. The case also has a small water reservoir within it to help keep the stone moist and protect it from any outside elements. The bottom of the case is also equipped with rubber studs to prevent the stone from slipping during use. The stone can be used with or without water and cleans up fairly easily by rinsing with cold water. This sharpening stone is by far the cheapest on our list which makes it a great buy. It also has some great features even the top models do not even have. This would be perfect for any beginner. The stone may be used without the use of any lubricant but it is recommended to use oil as it will bring a better result in the long run. This will make the process a little bit messier than without the oil but the oil will help to smooth out the ridges of the edge evenly. The stone is dual sided with very low grit grades of 1000 and 600. These are very low and not so much used for the finer tuning of sharpening. A little bit of work can go a long way with this stone so don’t overdo it. The stone also comes with a silica gel base which locks the stone in place and keeps it from slipping or moving around during use. This model of stone sharpeners is very basic when it comes to essential needs. The stone is made of synthetic materials and must be used as a water stone. The stone needs to soak in water for at least 10 minutes before use. Like the aforementioned sharpening stone, this one is very similar in all aspects except for the base. There is no base or anti-slipping device connected to the stone so sharpening could prove to be difficult. The stone is dual sided with two different grades of grit. The grit grades are also very low which mean the surface is very coarse and should only be used on very dull or unpolished knives. When it comes to diamond sharpening stones, this one is pretty good. Most other sharpening stones are a solid one piece while this one is several pieces. This diamond sharpening stone comes with 3 interchangeable surfaces. The plates are of different grit grades: coarse, medium and fine which allow an all-around perfect edge. The diamond stone also cuts very easily and fast taking the time and effort out of sharpening. The plates lock in a hard-plastic base to use when sharpening or when storing. The base also has silicon rubber studs to prevent any slipping when using the product. Most other sharpening stones do not come with any guarantee, but this one does, a 100% lifetime warranty. Last but not least is an oldie but a goodie! This is a sharpening stone you don’t see around too often. The stone is an oil sharpening stone but is also a 100% all-natural mined stone. This whetstone is mined from the Ouachita Mountains in central Arkansas and custom made by hand to bring you an extra edge in sharpening. The stone is single sided of fine coarseness to help gain a razor-sharp edge. The stone comes in a cool wooden case for storing and locking in place when in use. The bottom of the wooden case has a silicone lining to prevent any movement or slipping when in use. The stone does require you to use mineral oil when sharpening or honing which can be quite messy. But for an all-natural product that does several things, it is very fairly priced. 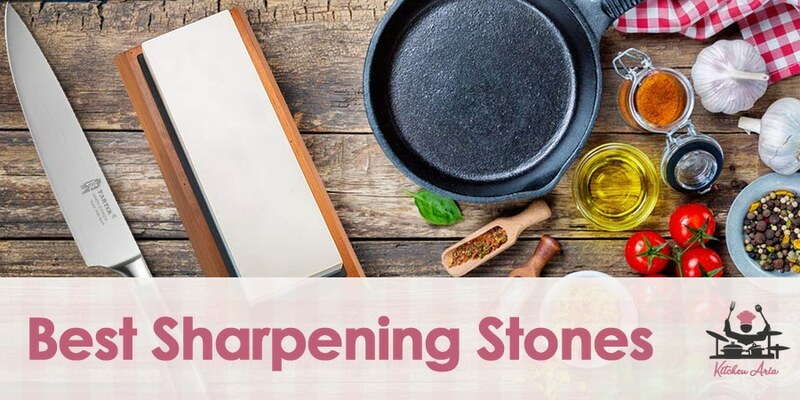 So, if you are tired of using sharpening steel or using one of those outdated sharpening tools, it may be time to invest in the best sharpening stone you can find. Make sure to get one that will appeal to your needs and if you are a beginner, buy a cheaper model to practice on with a knife you don’t care that much about until you are good enough to really hone in on your sharpening skills.